I hope everyone had a wonderful holiday yesterday! 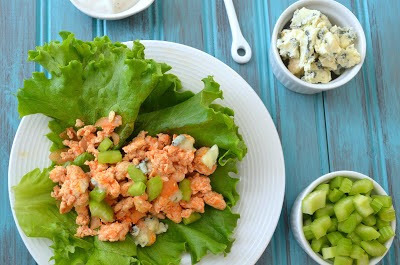 If you overindulged a little too much like I did, here's an easy and light meal that won't leave you feeling bloated and stuffed. 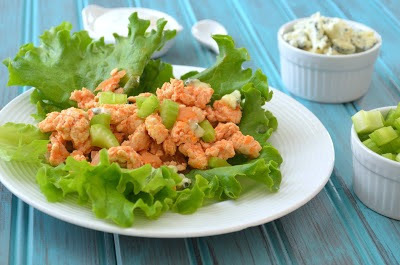 Ground chicken is marinated with hot sauce and topped with blue cheese crumbles, celery pieces and light Ranch dressing for a healthy and satisfying dinner. Since lettuce leaves are used in place of tortillas, they instantly become low-carb and low-calorie. Enjoy! P.S. Don't forget to enter to win a free one-year subscription to Southern Living Magazine! In a large skillet, cook the chicken, onion and garlic until chicken is cooked through, about 7-10 minutes. Drain off fat if necessary. Add meat mixture back to the skillet and add hot sauce. Cook over medium-low heat until hot sauce is absorbed, about 5 minutes. Place 2-3 tbsp. of the chicken mixture into the center of a lettuce leaf. Top with celery, carrots, blue cheese crumbles and/or ranch dressing. Enjoy!